National Crab Newburg Day is September 25th. 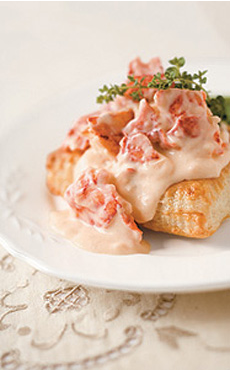 There’s also National Lobster Newburg Day on March 25th. Newburg or Newberg is very rich sauce of butter, cream, egg yolks, cognac, sherry, cayenne pepper and nutmeg, to which cooked shellfish—crab, lobster, scallops, shrimp—is added, alone or in combination. It can is creamed seafood; in fact, in French, the dish Lobster Newburg is called homard sauté à la crème (lobster sautéed in cream). Some sources credit M. Pascal, a chef of the once-famous Delmonico Restaurant* in New York City, with its creation, saying that it was originally named after Mr. Ben Wenburg, a frequent guest at the restaurant. According to Wikipedia, however, the dish was invented by Ben Wenberg himself, a sea captain in the fruit trade. In 1876 he demonstrated the dish to Charles Delmonico, the restaurant’s manager. After some tweaking by the chef, Charles Ranhofer, Lobster à la Wenberg was added to the menu and became very popular (it is exquisite!). Mr. Wenburg and the manager subsequently quarreled, and Wenburg demanded that his name be removed. The first three letters of his name were reversed to “New” to create the now-famous Newburg sauce. Ah, how short-sighted of you, Mr. Wenburg. How many of us refuse the opportunity to enter culinary history? Lobster Newburg served over puff pastry. Photo courtesy Mackenzie Ltd. In Chef Ranhofer’s printed recipe of 1894, the lobsters were boiled for twenty-five minutes, then fried in clarified butter, then simmered in cream while it reduced by half, then brought again to the boil after the addition of Madeira. A far simpler contemporary recipe is below. 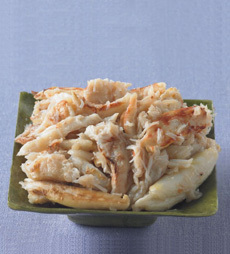 crab meat. Backfin or claw meat is just fine. Lobster Newburg is related to Lobster Thermidor, a similar dish that involves lobster meat cooked with eggs, cognac, and sherry that appeared in the 1890s. The dishes are so similar—seafood in cream sauce—that they are often confused for each other. The principal difference is the sauce. Thermidor sauce is thickened with a béchamel (white sauce, one of the five mother sauces of French cuisine), which made with a flour and butter roux. It is typically flavored with white wine, and with dry mustard instead of nutmeg. The sauce-coated lobster is stuffed back into the lobster shell, and can be topped with a brown crust of shredded Gruyère. The dish was created in 1894 at Marie’s, a Parisian restaurant located near the Comédie Française, to honor the opening of the play “Thermidor” by Victorien Sardou. Newburg sauce debuted almost 20 years earlier. Made with cream and egg yolks, is not thickened with flour and thus is is somewhat lighter. It is typically flavored with sherry instead of white wine. The seafood and sauce can be served over rice, noodles, toast, puff pastry or pastry shells. There are numerous variations on the theme of seafood Newburg. Mushrooms, onions and tomato paste can be added; paprika can be substituted for nutmeg (we prefer the nutmeg). Here’s the first recipe we made, adapted from Fanny Farmer. Depending on how large you like your portions, it can be a first course for 4 or a main course for 2. Mushrooms can “stretch out” the recipe for additional servings, and lower the cost of the dish. 1. SLICE the cooked seafood as needed. Cook with the butter for 3 minutes in a large non-stick saucepan. If using mushrooms, first sauté in butter; then add seafood and additional butter as needed. 2. ADD cream, beaten egg yolks, and seasonings to taste. Stir over low heat until slightly thickened. Add sherry and brandy; cook 1 minute more. Serve on toast or puff pastry. *The original Delmonico’s was operated by the Delmonico family in the Wall Street area of Lower Manhattan, beginning in 1827. Established by Swiss brothers John and Peter Delmonico, the Delmonico presence expanded as other family members opened restaurants using the same name. The original grew into a grand destination, attracting the rich and famous, including visiting royalty. The space still stands at 2 William Street. You can still eat there, although the restaurant is now operated by an unrelated company (here’s the history). The restaurant is credited with Eggs Benedict, Chicken à la King, Delmonico Potatoes, Delmonico steak, Lobster Newburg. Credit is also given for naming Manhattan Clam Chowder, and the name of Baked Alaska.